Houston is a village in Renfrewshire, Scotland, with a population of around 7,000. There is an older centre (designated a conservation area in 1968) with a variety of small shops, restaurants and public houses, but the village is mainly composed of housing and chiefly serves as a popular commuter village for nearby Glasgow and Paisley, as well as being the centre of the civil parish of Houston and Killellan. It has a long history, with records going back to the 12th century, and archaeological remains from the Stone Age, 3,000 years ago. Houston was originally known as Kilpeter (“Cille Pheadair” in Scottish Gaelic – the chapel of Peter). A fair used to be held on Peter’s Day, in early July. Though the chapel has disappeared, the old name is still remembered in St Peter’s Well north of the village. The Kilpeter lands were granted to Hugo (or Hugh) de Padvinan in the 12th century, and the village which grew up around his castle was called “Hugh’s toun”, which became “Houston”. In the 18th century a new owner demolished part of the castle and the stones were used to build a new village further away. The Houston Inn, built in 1784, is one of the few buildings still in existence. The population numbered around 1,000 at this time. Houston was originally a weaving village, producing cotton, muslin, lawn and silk gauze. Crosslee Mill to the south was set up in 1793 as a cotton-spinning mill. In the nineteenth century Houston became a centre for embroidery. In 1851 Queen Victoria, opening the Great Exhibition in London, stood in front of a richly embroidered curtain made in Houston, The velvet cushions then used in the House of Lords were also embroidered here. Machine embroidery, however, was cheaper and faster, and the special Houston industry of hand embroidery came to an end around the beginning of the 20th century. 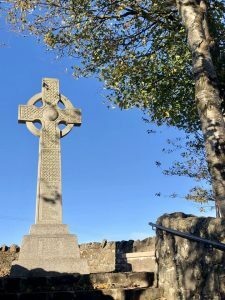 The 8th century Celtic Barochan Cross, over three metres high and made of cream-coloured sandstone richly carved with human and animal figures and interlaced lines, once stood at a crossroads south of Barochan mill, not far from Houston. About 1790 it was moved by the landowner to a small hill nearby, becoming a well-known local landmark. Unfortunately the cro ss was damaged in this move, and over the next two hundred years its surface was badly worn away by the effects of wind and weather. When it was removed for repair in 1977, experts decided not to return it to an outdoor site, and it is now housed inside Paisley Abbey (www.paisleyabbey.org.uk) in the south-west corner of the nave. Though the details of its carvings are now hard to make out, it is still a beautiful thing to see, reminding us of the earliest days of Christianity in the area. The Mercat Cross stands in South Street, and is a well-known landmark beside the equally well-known restaurant & public house, the Fox & Hounds (www.foxandhoundshouston.co.uk). Dated 1731, its base may date from as early as the 14th century. Of these three magnificent houses, sadly only Houston House remains. Craigends House, pictured right, was situated to the east of the village of Crosslee, near Houston. 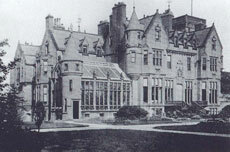 It was a spectacular Baronial mansion, built in 1 857 and owned by the Cunningham family. The house lay empty from the 1960s and became increasingly derelict. It was demolished in stages, with the last remains being removed in 1980. 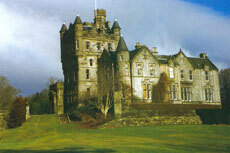 Barochan House, below, was built in the late 16th century to replace an earlier house which had been destroyed by fire. It was home to the Fleming family for approximately 600 years. Most of this house was demolished in 1947. 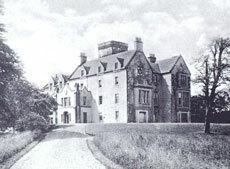 Houston House, below, which belonged to the Houston family, was built around 1872 on the site of Hugo de Padvinan’s castle, after it had been demolished. A small part of the castle was incorporated into the house. Today the house is divided into flats. Kilellan – sometimes spelt Kilallan – was a parish with its own church until united with Houston in 1760. Kilellan had no village, but covered many small farms and a mill and a smithy. The name “Kilellan” means the “chapel of Fillan”. St Fillan was an Irish monk who lived in the area around the year 740, in the early days of Christianity in Scotland. The present church at Kilellan was built later to replace Fillan’s chapel. A stone above one of the doorways shows the date 1635, but the stonework of the walls may be several hundred years older. A font once used for baptising babies is now built into the churchyard wall. Only the remains of Kilellan church can still be seen. Kilellan manse is still lived in and is thought to be the oldest inhabited house in Renfrewshire. Information reproduced with the kind permission of Renfrewshire Libraries.